An extraordinary blend of personal experience and Indian mythic elements, Devi lures us into an epic, spiritual voyage. Join Suzanne Ironbiter in her quest for peace and stability, her recovery of the dark, repeating rhythm of the earth. Discover with her a symbol of wholeness that seeks to heal our divided minds. The patriarchal society of today appears to point nowhere ahead except to death. The move as shown in Devi to a female-centered pantheon is urgently needed…. [Devi is] a powerful, personal yet impersonal search for self and Self. Suzanne Ironbiter has a doctorate in History of Religion from Columbia University and teaches at Purchase College and Hunter College of the State and City Universities of New York. Her specialties are European and Indian mystical philosophies and epic poetry. Her focus developed under the guidance of the late Acharya Sushil Kumar, founder of the World Fellowship of Religions and the International Mahavir Jain Mission dedicated to religious harmony and the nonviolent path. Her poetry and novels engage with conflict in and around us, and heroic effort toward peace. 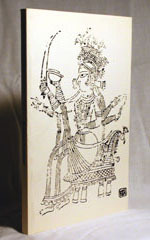 In her narrative poem DEVI, this heroic effort is personified in powerful goddess energies as they emerge from Indian myth into the imagination of the narrator, Suzanne Ironbiter.